I did it! I wore my white denim out of the house! We celebrated my dad’s birthday yesterday, and I decided that was the perfect event for their debut. I mean family is kind of forced to put up with my crazy and irrational fears of wearing white denim, right?!? I have good news to report, I did not sit in or spill anything on my jeans! Yep made it through the whole event STAIN FREE! A definite first time out success! My outfit today is probably one of the looks I was most excited about for my new white denim. 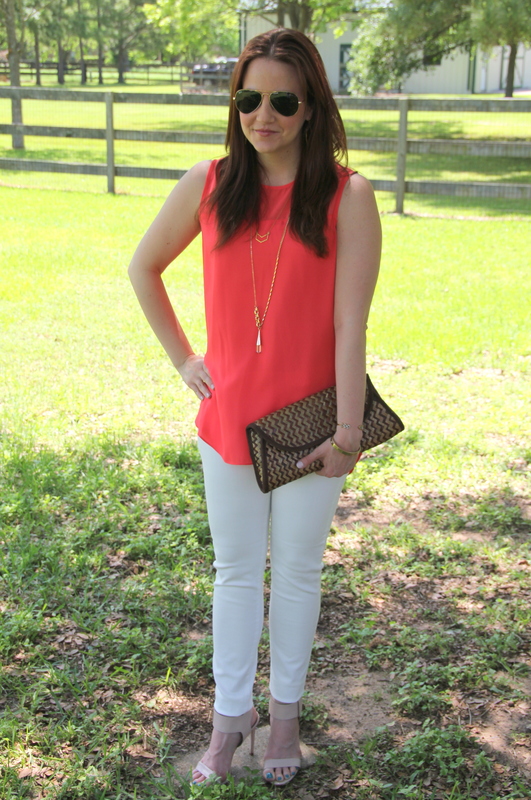 I think bright colors look so much more bright and vibrant with white pants. 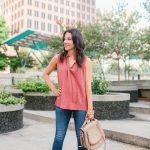 Don’t believe me, check out the last time I wore this top on the blog in the Restyled and Remixed section at the end of this post! The top just looks more colorful to me. 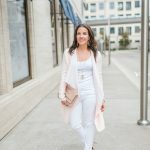 I feel like white denim provides a blank canvas that is perfect for a splash of color. I love my dark colored jeans, but I am really loving how crisp and clean the white denim looks. I definitely think they are better fit than the dark jeans for spring and summer daytime events! 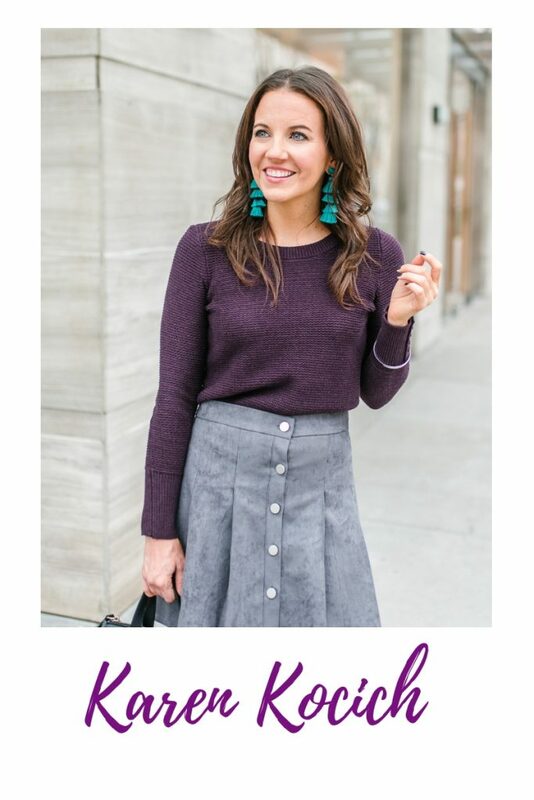 I have some brunches and family parties coming up, and an outfit like this one is going to be perfect! I was so happy to hear that I was not the only one who fears wearing white pants. I have enjoyed styling my white denim, so I am considering these spotless white jeans from Joe’s Jeans. They claim to be stain resistant! Has anyone tried them? Are they really stain resistant and worth the price tag? 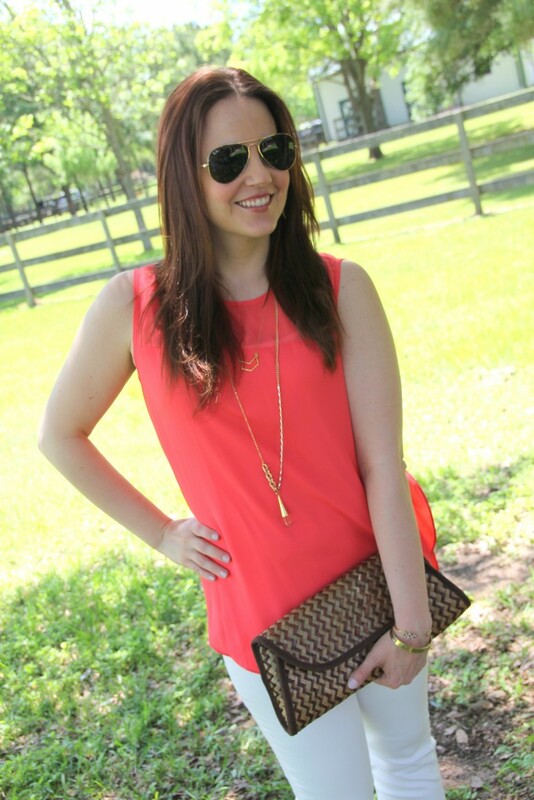 VINCE CAMUTO BLOUSE: Spring is Here!! This is a perfect look! I love white denim with brights too. 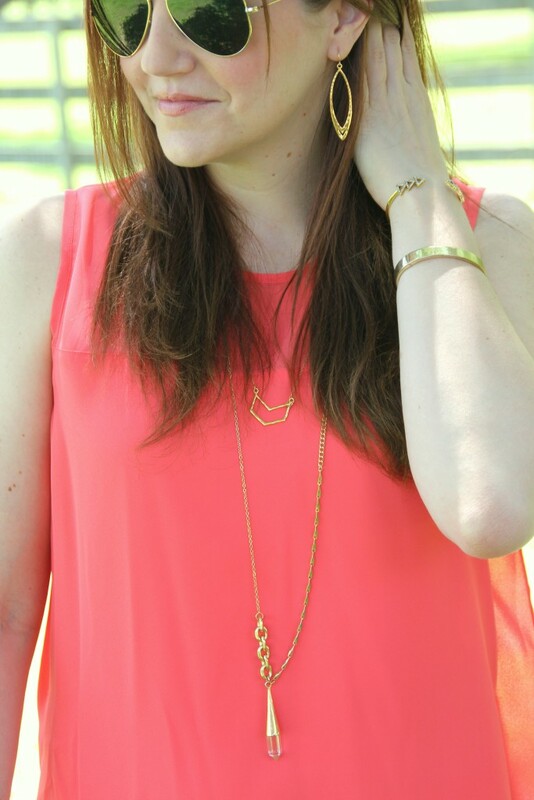 I also love the pop of bright blush! Thanks for linking up with us at the Best of the Blogosphere! Love the color and the clutch! Me and white pants just don’t mix! I love the pop of that shirt with the white pants, and well done on wearing them incident free! Love your top, hun! That color is so fresh and vibrant, but looks very classy too! Loving this outfit! I’m in the market for white jeans BEFORE Friday! 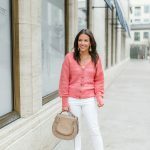 It’s funny because I just blogged yesterday about how I manage to get something on my white jeans EVERY TIME I wear them. Yay for no spills! I’m loving this outfit, it’s crisp, & bright. It amazes me how white changes the color of tops, and brings out certain design elements in patterns. Gorgeous! love the simple and chic outfit! the top has so beautiful color! 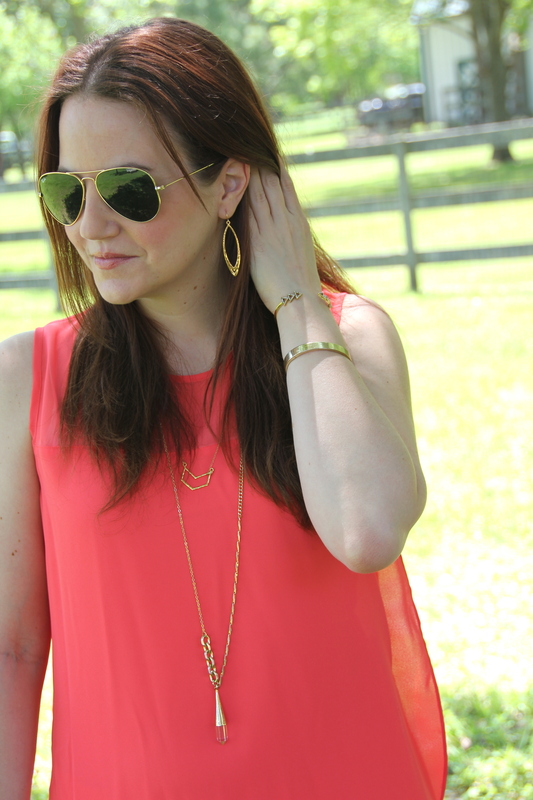 Love that top, such a fun color! 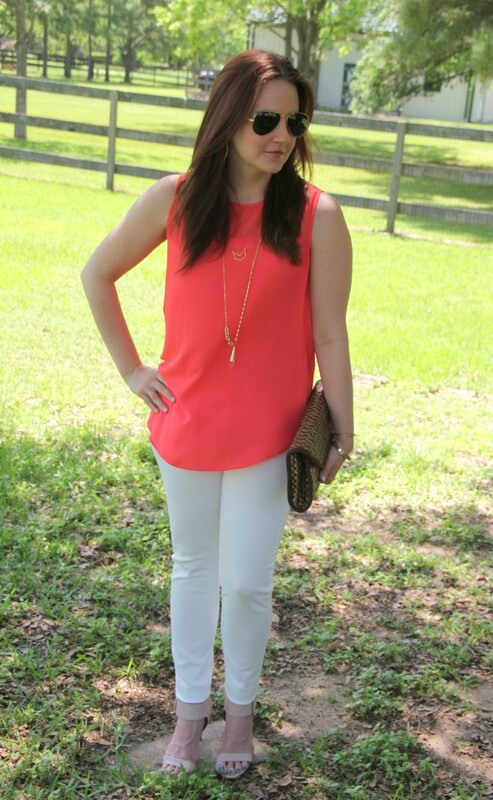 Really love the coral top. Happy Spring! Thanks for linking up today. 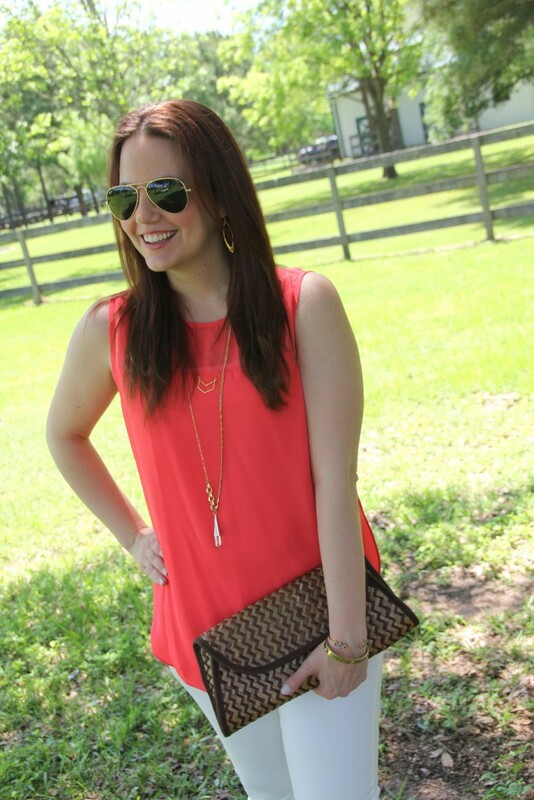 Such a fun and summery outfit!! This is such a cute look! 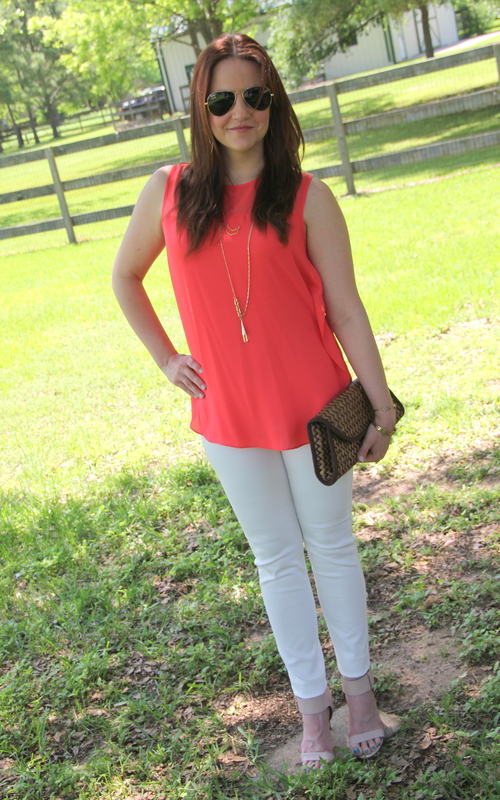 I just love the bright top with white denim! You look wonderful! That top is super cute! And I love the white skinnies! That’s such a pretty shade and perfect for the season!